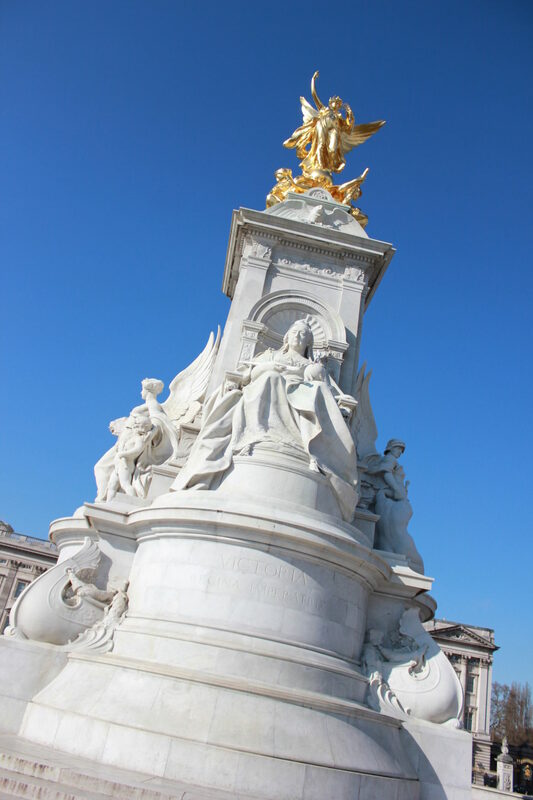 London’s magnificent Buckingham Palace is more than just the home to the British monarchy, it is one of the most visited attractions in the city. Its public art gallery, picturesque statues and ornate gates that surround the royal residence are a big draw. But, the major event happening all year round and attracting the biggest crowds is the Buckingham Palace Changing of the Guard ceremony. 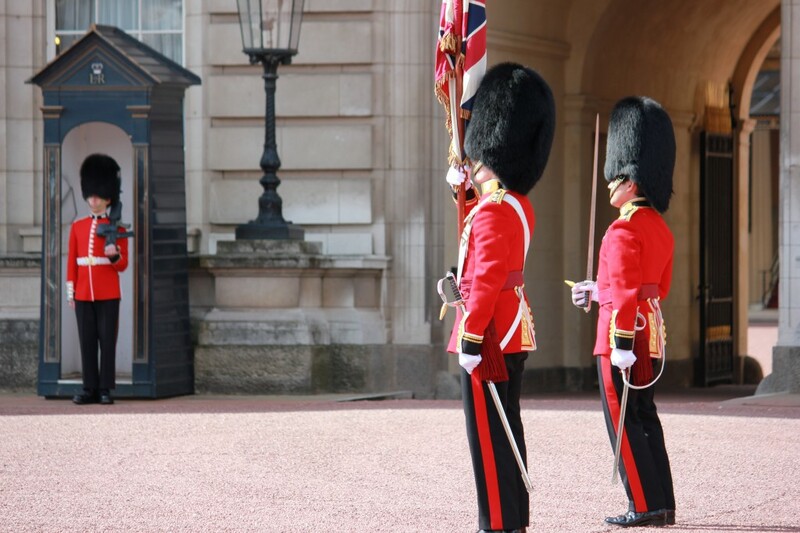 This is a formal procedure performed by the guards where the old guard protecting the palace hands over responsibility to the new guard. It’s hyped up activity is accompanied by music from the various energized bands (they played Queen’s ‘We are the Champions’ when we were there!). 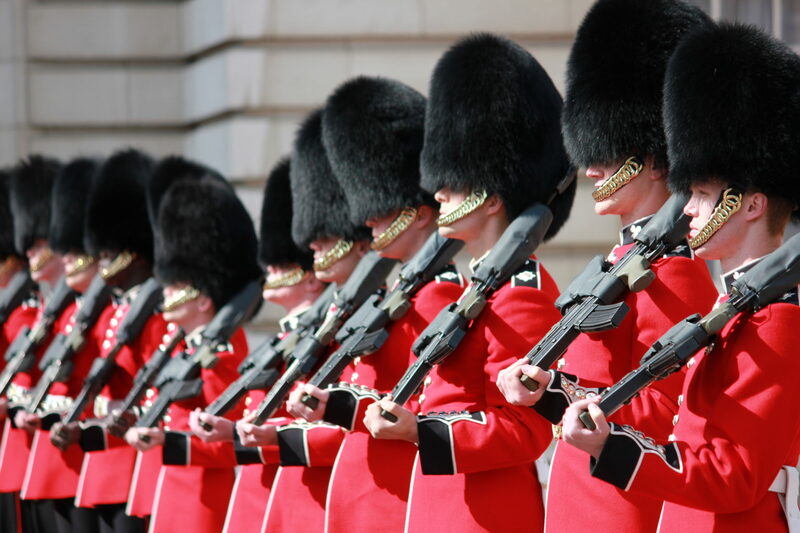 In an interesting twist of things, the old guards wait at the Buckingham Palace to hand over, whilst the detached old guard marches from St. James’s palace to the Buckingham Palace in a bid to hand over too. Meanwhile, the new guards’ procession marches from the Wellington Barracks up to the Buckingham Palace too, to take over a new shift. 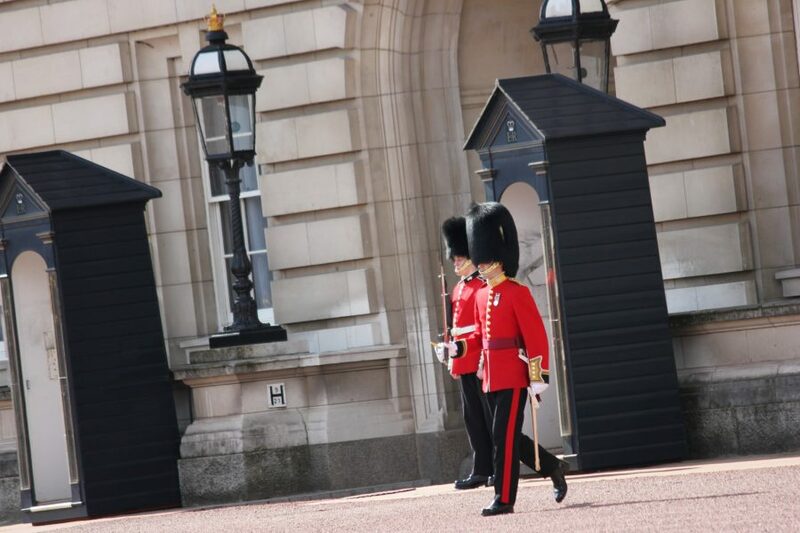 After all the formalities at the Buckingham Palace are complete, the new guards remain at the Buckingham Palace and the other new guards walk back to the St. James’s Palace to assume duties. 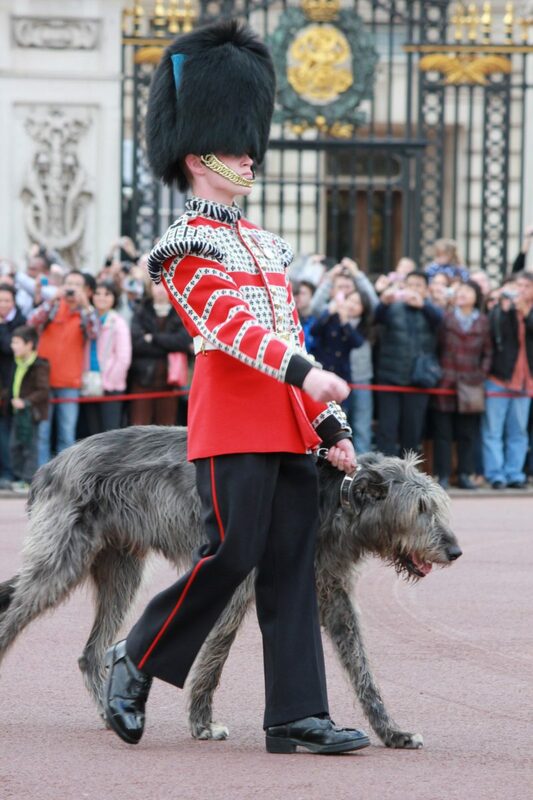 The old guards then quickly stroll back to the Wellington Barracks. 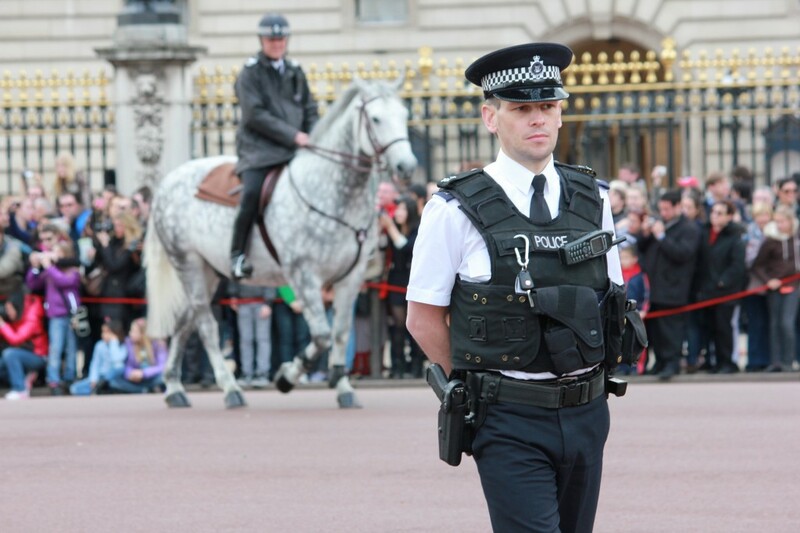 There are three main points to view the epic Buckingham Palace changing of the guard event. They are the Buckingham Palace, St. James’s Palace and the Wellington Barracks. The Buckingham Palace area gets crowded, so you may take a more realistic approach and walk around the St James’s Palace and Wellington Barracks locations to have a better, less crowded view of the processions from there. 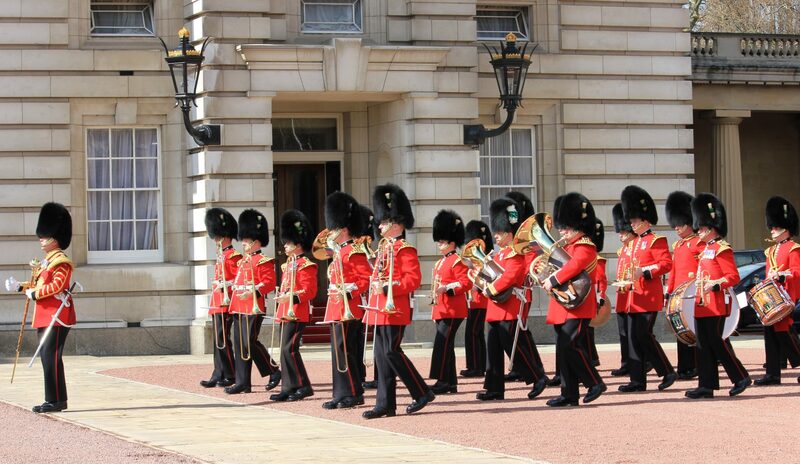 Don’t worry if you don’t catch the guards marching to the Buckingham Palace, you can also catch them on their way back from the Buckingham Palace to St. James’s Palace and the Wellington Barracks. Since there is a lot of to and from between the three points, you are at the least assured of a peek at some point of the uniformed guards. At 10:00, I was able to get get front row standing at the palaces gates. 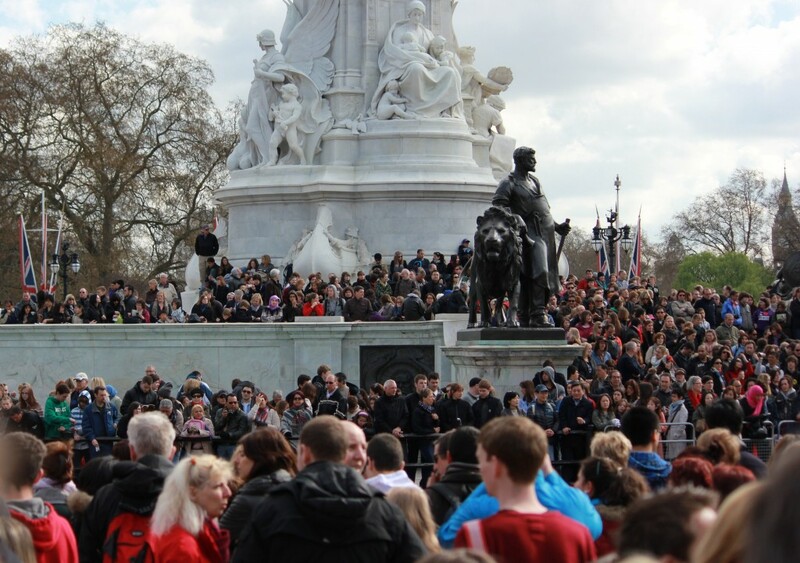 A half hour later the front gates were a half dozen people deep and hundreds of people cluttered Queen Victoria! 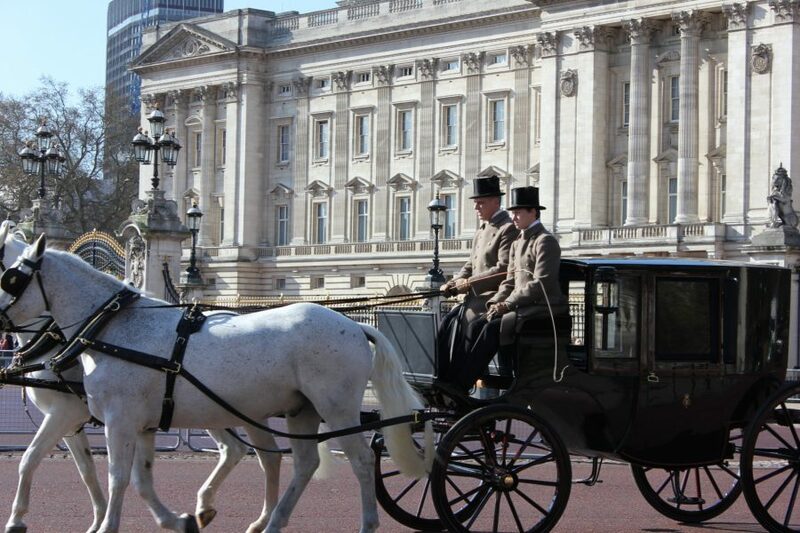 The current schedules are every Monday, Wednesday, Friday and Sunday at 11.00 each day at the Buckingham Palace. 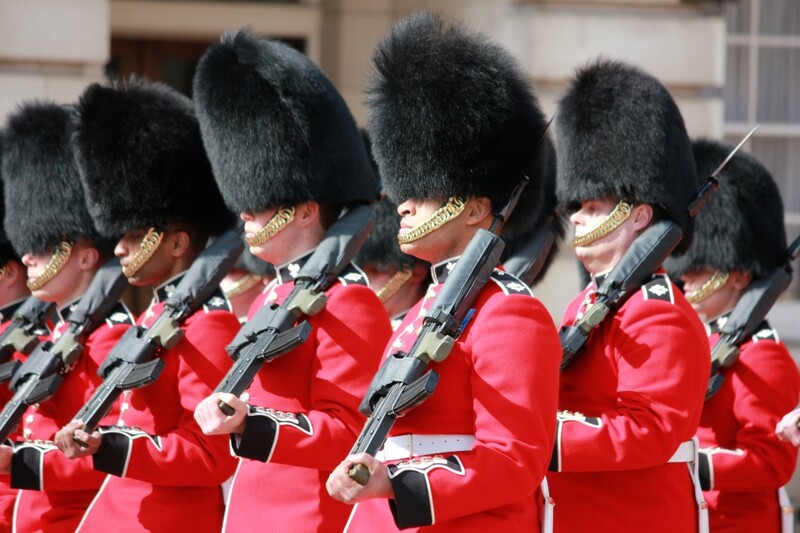 Prior to the ceremony at the Buckingham Palace, you can also head over to the Wellington Barracks at 10.30 as the guards prepare to leave for Buckingham Palace. 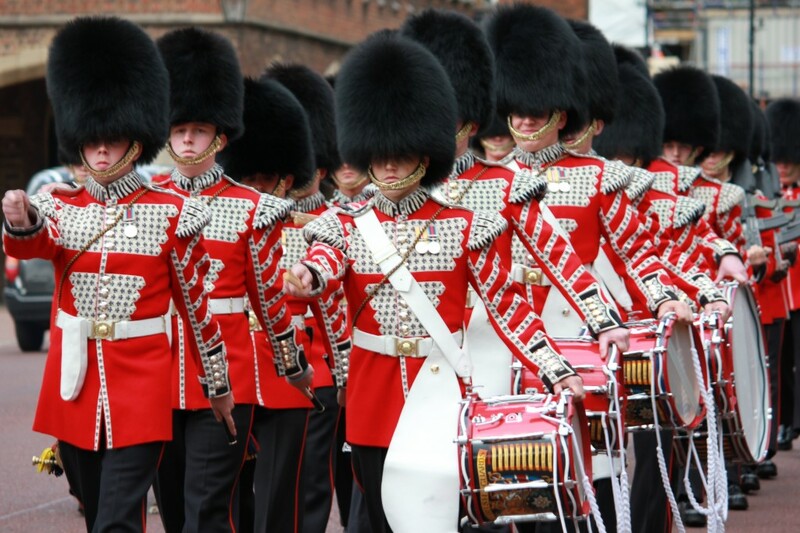 At about 10.43 you can choose to be at the at the St. James’s Palace where the old guard sets off for Buckingham Palace. The schedule is very elaborative and will give you an insight on what role each regiment will play for the day. Point to note is that every month there is a new updated schedule rolled out and it is advisable to re-check online before confirming your trip. Keep in mind that cancellations can occur anytime especially due to bad weather conditions or other events overlapping. If it is beyond the Palace’s control especially when it comes to the weather, the cancellations can even take place a few minutes before the start of the ceremony. Always keep yourself up to date with the regular notices on the palace’s website. 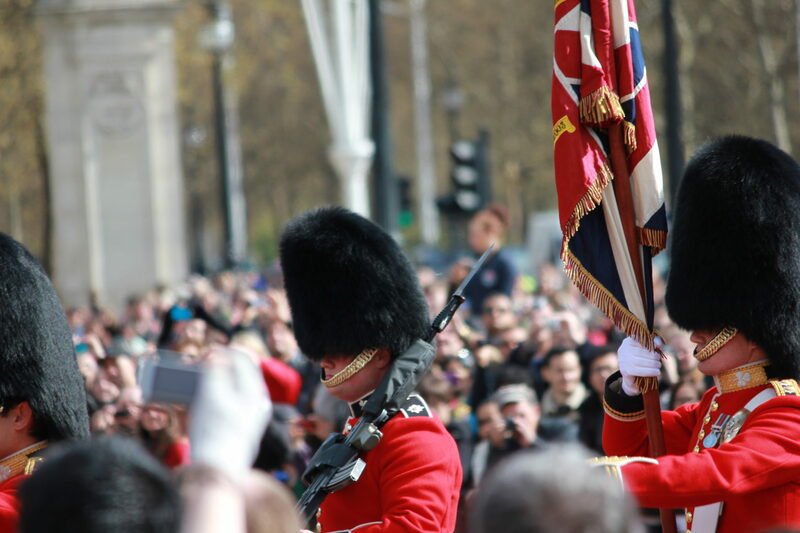 The best way to get to the parade is by catching the Tube to the Green Park underground station and it’s a walking distance to the St James’s Palace. 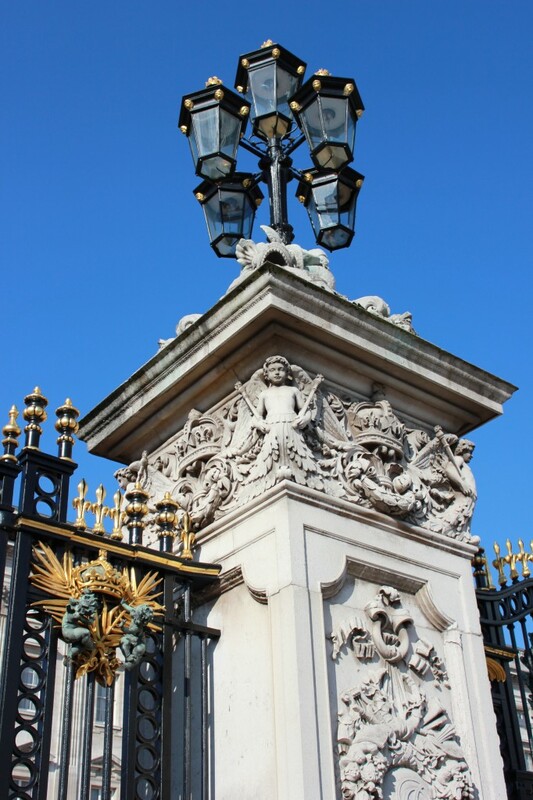 Leave the station via Piccadilly South exit and get yourself to the end of St. James’s street, where you will then see the gate to St. James’s Palace. Once here you can walk your way around the other two locations and derive the best from the Buckingham Palace changing of the guard ceremony. 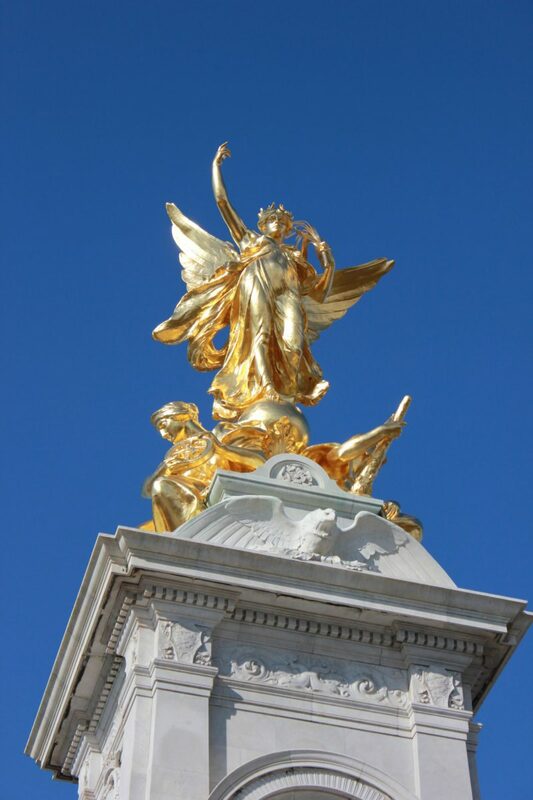 INTERESTING LONDON TOURS: There is so much to see and do in London, booking ahead of time may be beneficial for you. We arrived to Buckingham Palace at 9:00. The early arrival did give me the opportunity to photograph the exquisitely ornate gates and the one guard stationed at his post. 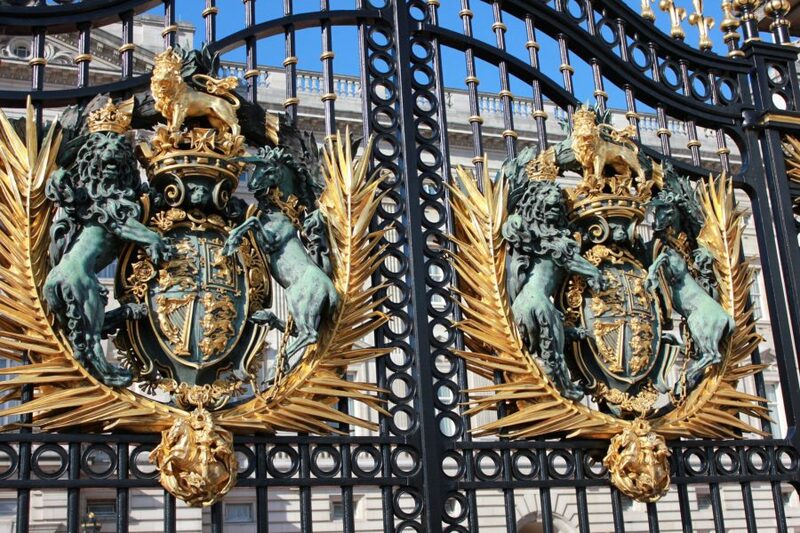 The official British Monarch coat of arms, The Royal Coat of Arms, adorns the front gates to the palace. I had never seen such spectacular iron and stone work. By 9:45 we felt comfortable enough to step away from the front of the gates to inspect the statues that surround the palace. The impressive Victoria Memorial which stands directly in front. The structure is made of 2,300 tons of marble. 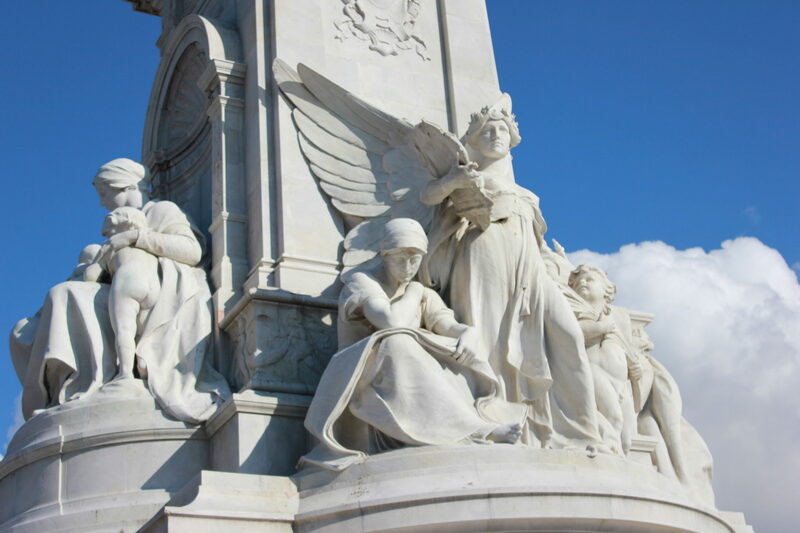 The massive memorial is seemingly protected by a few surrounding statues; Angel of Truth, Angel of Justice and Charity. 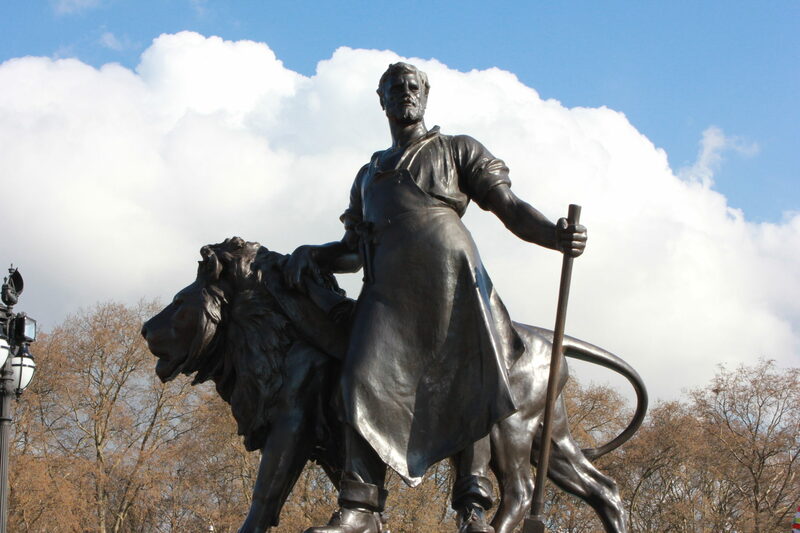 There is a similar monument for her husband, Prince Albert, that we saw while strolling through Kensington Gardens. Both are equally as grand. By 10:00, we were ready to pick our viewing location and though there were a couple dozen people there already, we still got front row at the iron gates. By 10:30 the front gates were about six people deep. After waking up early, and waiting an hour & a half sardine packed, the events of the Changing of the Guard at Buckingham Palace started just before 11:30 AM. The horse and carriage were followed by the marching horses. The folks who crowded the Victoria Monument had the best view of this. But then a beautiful horse and carriage sauntered by and then the Changing of the Guard began with one guard pacing while the other sternly kept his posture and expression. Dozens of guards the marched into the gate doors, not a smile in the bunch. 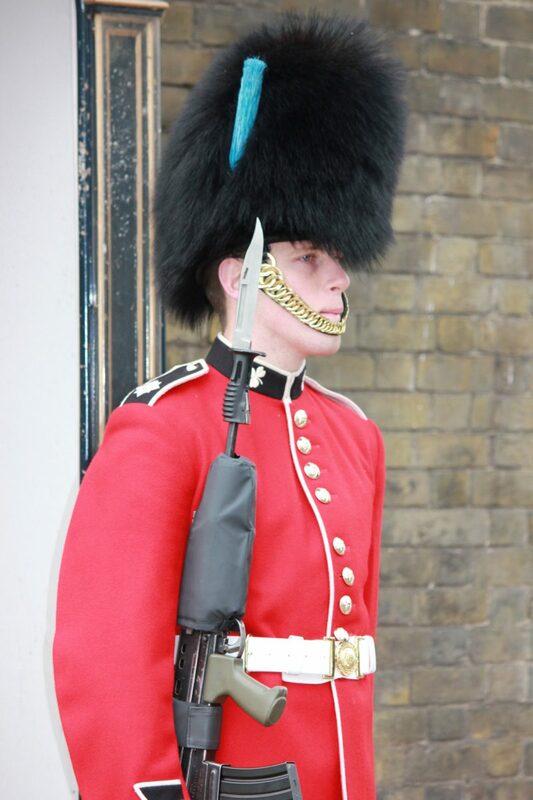 Being that these guards are actual serving soldiers of the British Army, they meant business. You have to respect them as they are known to be some of the most elite and skilled. The band arrived and set up just to the left of the gates doors, this is the position I would opt for next time. The crowd was silent as we waited to see what was in their musical repertoire. They started their set with Queen’s ‘We are the Champions’, followed by Sinatra’s ‘Mack the Knife’. Completely unexpected, and awesome. We decided to leave our front row standing position a tad early in order to avoid the crowds. 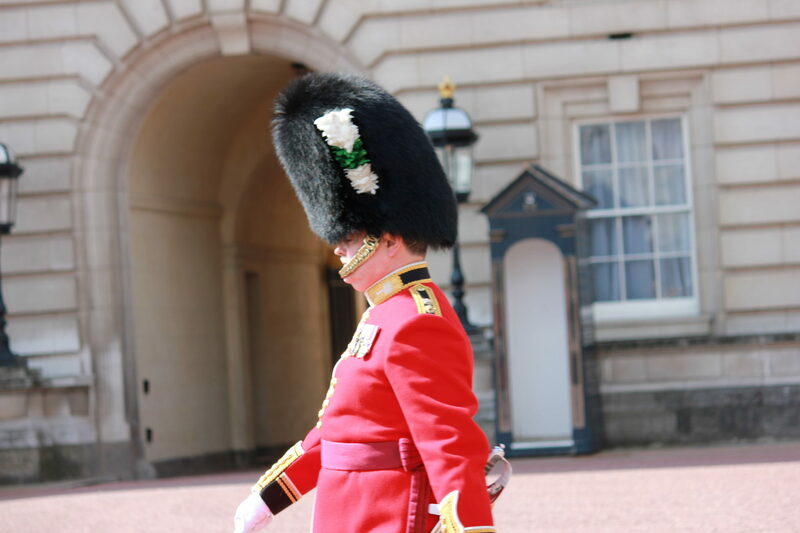 We headed towards St. James Palace on our way to catch the tube and got a second show—standing guard on Stable Yard Road was one Irish guardsmen. Perfect for photo opportunities. We continued one block up to Marlborough Road and were struck by the band marching, returning back to their headquarters. If you find yourself in London this would definitely be one of the must do tours to include in your itinerary and to make your trip memorable. There are not many palaces in the world still functioning up to date, that still embrace their old culture, so expect this to be a unique experience. Remember London is known to be a busy city, therefore ensure you give yourself sufficient time allowance to get to your destinations on time. Whether you are traveling alone or with family this is also a kiddy friendly tour, so you need not worry about the little ones. 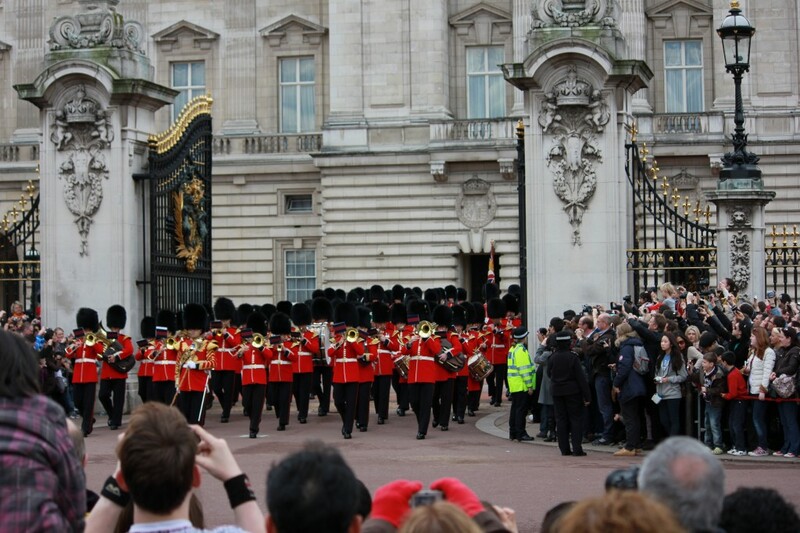 Another great appealing thing to note is the Buckingham Palace changing of the guard attraction is free of charge to the public! Nice photos. That's quite a lot of people. I wonder if it is always like this for the Changing of the Guard. I will have to check Part 2 to see the rest of the photos. You definitely got good "seats" for the show so I will remember to get there early if I want to see this. We were actually there during off-season. It’s hard to imagine, but I bet there are more people when it is actually warm out. What a cool experience! 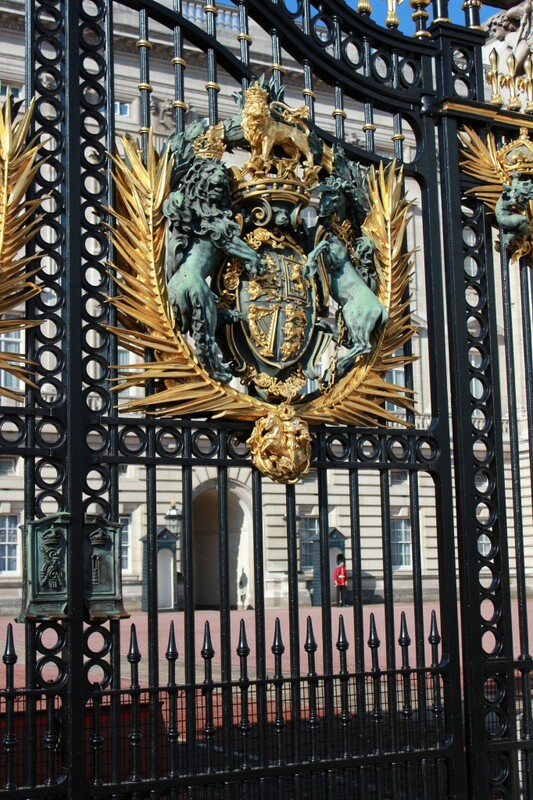 I have never been to Buckingham Palace, but I would love to go someday! How cool is that! I would love to be able to see this in person. It was really cool, I hope you are able to see it one day! I knew there are always many people, mostly tourists waiting for the change of guards, so that's not a surprise. I can’t imagine how cold the guards must be in the winter! Great shots. 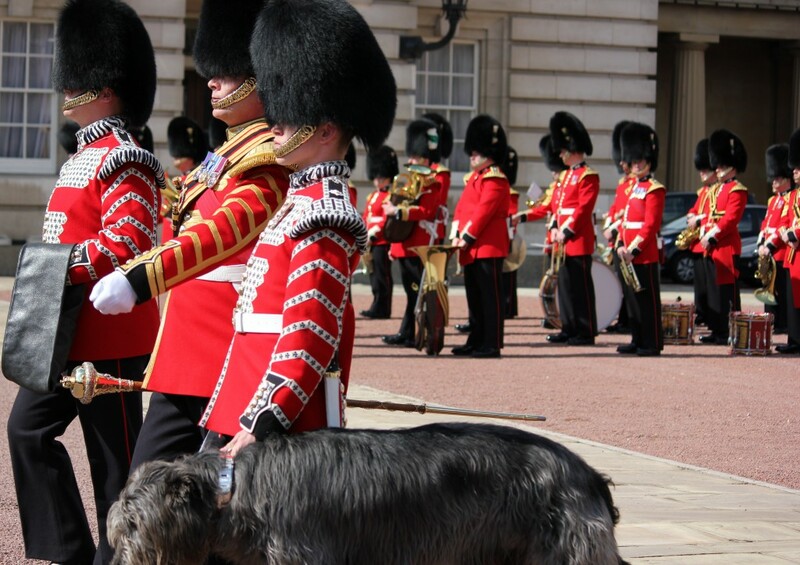 I saw the changing of the guard for the first time last year when my mom came to visit me and then again earlier this year when a friend came to London. Oh also I don't think London really follows 'off seasons', there are tourists here ALL the time. I bet there are plenty of tourists there all year long, but not as many as are going to be there for the Olympics! I’m sure all of the attractions will be doubly packed. Wow.. I had no idea how many people now turned out to watch. I saw it years ago, when I just happened to be pottering past, and there was hardly anyone else there. Maybe because it was a such cold day? Or last century? Who knows… but now I'm feeling lucky to have seen it by chance one morning. Gasp! You absolutely have to go! Great pictures and a real insight for anyone planning to turn up at the Palace ten minutes before the ceremony thinking they will get near to railings or on the steps of the Victoria Memorial. I am happy we got there early! 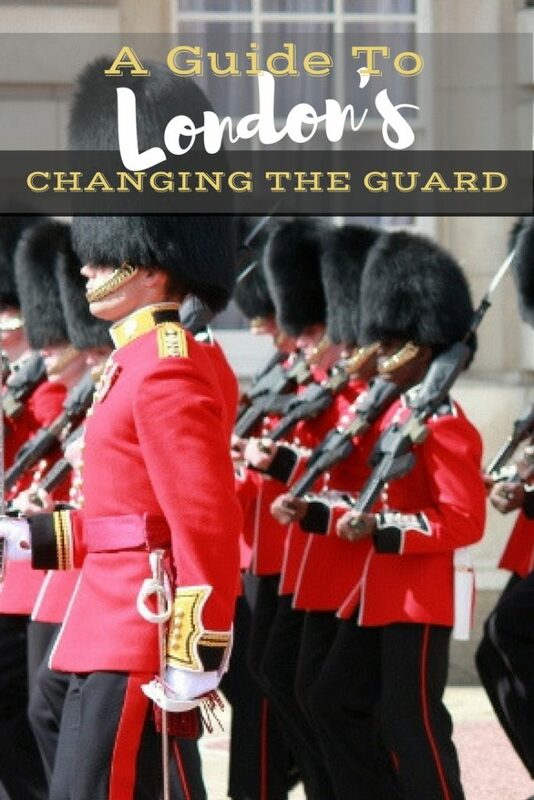 Should you get back, contact me through changing-guard.com and I will send you ‘walk with the guards, a walk that lets you see a lot more of the ceremony and some great photo ops. That would be great! I’ll let you know if I make it back. What a interesting blog post! This is a great post and place you visited. Lovely pictures. It is surely fun things to see; now I am excited to watch it soon. Thank you for sharing. Interesting to watch, I sure everyone will enjoy it. Thank you for sharing this with us. London is definitely going to my bucket list. Thank you for sharing this. The pictures that you have included are simply mind-blowing.